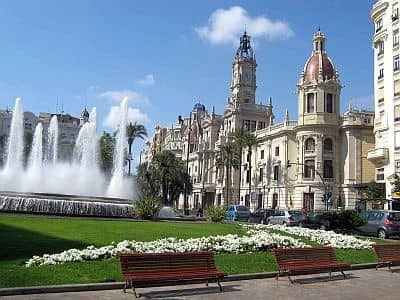 In Valencia, a city located on the east coast of Spain, and on the Valencia Coast (which includes towns such as Sagunto, Alboraya, Cullera, Gandia, Miramar, Piles and Oliva), the climate is Mediterranean, with mild, relatively rainy winters and hot, sunny summers. The daily average temperature ranges from 10.5 °C (51 °F) in January to 26 °C (79 °F) in August. Here are the average temperatures recorded at the airport. 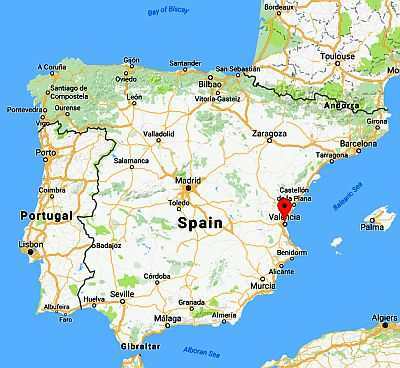 The rains amount to 470 millimeters (18.5 inches) per year, and follow the Mediterranean pattern, in fact they are concentrated from September to April. However, even in the rainiest months, the rains are quite rare. The rainiest season is autumn because of the prevalence of southerly winds; in winter, it does not rain much, since weather fronts come from the west, while the city is facing east. In summer, it almost never rains. Winter, from December to February, is a mild season, and it's characterized by sunny periods alternating with periods of bad weather, with wind and rain, which, however, are quite rare. There's a good number of sunny days, with daytime temperatures reaching 17/20 °C (63/68 °F) even in winter. Very cold days are rare: only on colder nights the temperature drops to freezing (0 °C or 32 °F) or a few degrees below, but even in these cases, during the day it typically remains around 10 °C (50 °F). Although in the inland areas of the Valencian Community it can sometimes snow at an altitude higher than the plain, snow in the city is a very rare phenomenon: the last major snowfall dates back to the 11th of January 1960; a less intense snowfall has been recorded on the 12th of February 1983. Summer, from June to mid-September, is hot and sunny. Typically, temperatures hover around 28 °C (82 °F) in June and September, and around 30/32 °C (86/90 °F) in July and August. The weather is hot and humid, but there is also the breeze from the sea, in short, it's the typical Mediterranean summer. Sometimes, however, there may be heat waves, with highs reaching 35 °C (95 °F). When the wind blows from the interior, temperatures can reach or exceed 40 °C (104 °F), but fortunately in this case the air is dry. Autumn, from mid-September to November, is initially warm, and then becomes gradually milder, while tre first Atlantic low-pressure systems begin to affect this area. Every now and then, the rains are concentrated in a short time and can be heavy. The sea in Valencia is warm enough for swimming from July to September, when it reaches 24/26 °C (75/79 °F) (ie, more than in other parts of Spain); it remains cool until June. The best time for a beach holiday in Valencia is the summer, from June to August. The water temperature is comfortable enough from July to September; however, in September, which is still a good month (especially in the first half), the first Atlantic depressions begin to affect this area. May and June are sunny months, but the sea is still a bit cool, especially in May, when it is actually a bit cold. Although good weather is not always guaranteed, spring and autumn are ideal for visiting the city and for excursions to the interior, as in summer it can be very hot.